So I totally dropped the ball with Saturday's Real Chat post. Reason? Plum forgot to post it. I had a great one ready to go too! I have to get into the habit of posting on Saturdays, and I apologize for the miscommunication! Promise I won't forget this week! Date night that included real good southern food. Skee ball and arcade games followed (we thrive off competition). Witnessing a friend's beautiful baby be baptized and celebrating with good friends. Veronica took her first steps (I think she knows she turned one)! Antique market hunting. One of my finds here. Sunday night grilling. Just the four of us. To link up your modern modeste outfit posts, simply leave the post in the linky tools below, grab a button or text link back to this original post! Looking forward to seeing your posts! You look exceptionally gorgeous in these pictures Anna! Thanks for hosting the linkup party! i need that vest!! love it soo much! Gorgeous! 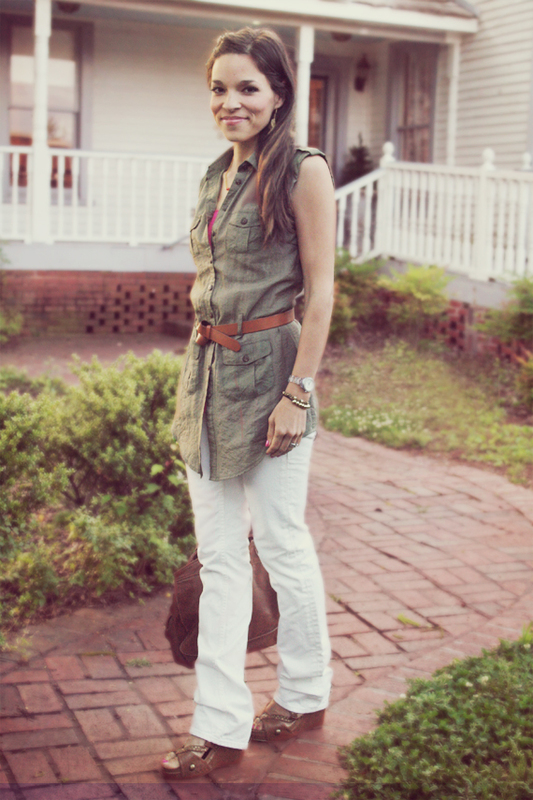 I have always been a huge fan of olive green + white denim! Gorgeous outfit - a little bit of pink does it sometimes! I love the subtle pop of color - gorgeous! you look lovely Anna, love the way you knotted the belt. Yay for first steps for Veronica!!! your pictures are fantastic, as always. I love how you always look genuinely happy in your pictures. Love that color top on you. And those beads are so great! Great find! the necklace!! i need to order one asap. You look amazing. And so happy! Sounds like a great weekend. Aww what a fun weekend!! I read your tweets over the weekend about skee ball and was totally jealous lol. You look so comfortable and still so chic in this outfit. Love it!! I love Across The Pond jewelery! :) Lovely! Lovely look! The perfect combination of neutrals with a punch of color. Love your necklace. You look beautiful, as always! : ) Love the pop of pink. And I really love that you're wearing one of Megan's necklaces! So fun. 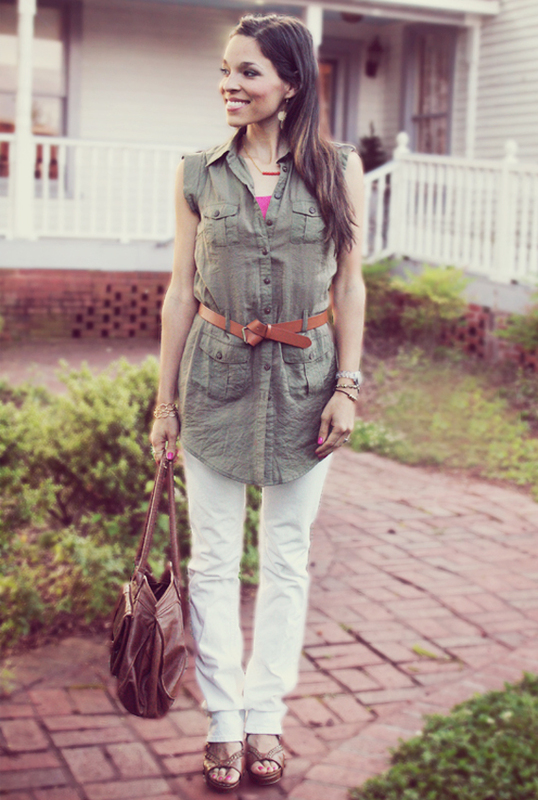 Love the white and olive together. Such a crisp look. Cute look! Love the little pop of pink and your necklace! I think this is my favorite outfit. You look great. Ah love the little peek of color! Beautiful as always Anna! I think I need to link up this week, it's been too long! I was shopping like a mad woman on friday looking for white jeans. Love your pairings! 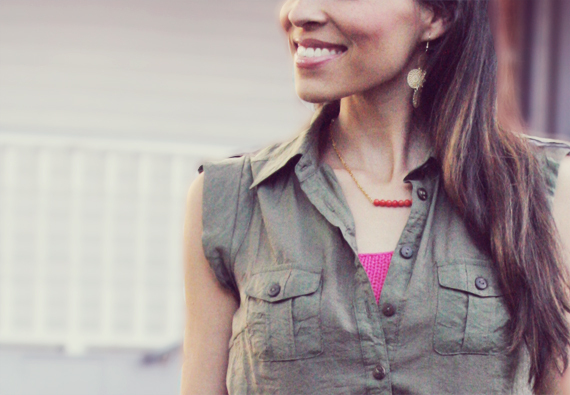 olive and hot pink is one of my favorite combos! Love the outfit, Anna! I love the little peep of bright pink in there. Always find myself wishing I looked like you when reading these posts! That date night sounds like so much fun--I love arcade games! I love the touch of bright colors in this look! I forgot to link up today, but can I link up another day? I've been meaning to join in, but I can't seem to remember! LOVE that army color on you! That top is such the trend right now!! You look adorable! I love that army-esque top. Too cute. How beautiful is your home? I love the white railing! Skee ball is the best! I love your tip Anna, so versatile, looking great! Thanks so much for hosting yesterday, Anna! You are absolutely gorgeous. Army green is one of my new favorites and you wear it so beautifully. Hope you have a lovely day! Love this outfit, effortlessly chic! Sounds like you all had a great weekend, yay for Veronica starting to walk! Great color combo! I did just get a fuchsia silk top and pairing it with my cargo's is something I didn't think about until now. Thank you! So beautiful! I love the way you tied your belt. 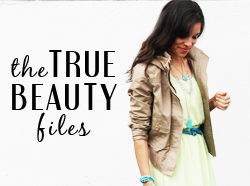 i always love your true beauty files :) you do such a great job! Sounds like a great weekend! First steps is always an amazing sight! I am loving your outfit! That button up is cute! I love your blog and your beautiful style. I did a little highlight over at my blog of you. Hope you love it! a touch of bright is sometimes all one needs :) i really like looking through your outfits. ohhhh... what a lovely look from top to bottom! i love how you tied your belt!